One observation of a gull was remarkable. A gull in non-breeding plumage was swimming not too far from the shore. Heavy streaks on the neck were clearly visible and the bill showed a black ring on grey ground. A black area below/in front of the eye underlined the head markings even more. Only checking the images at home, it was possible to identify this gull as a Common (or Mew) Gull, Larus canus moulting in 2nd winter plumages. According to local ornithologists the Common Gull in September is an unusual record. Usually the Common (or Mew) Gull, Larus canus is starting to appear on its wintering grounds only with November. As it is said, that the subspecies L.c. 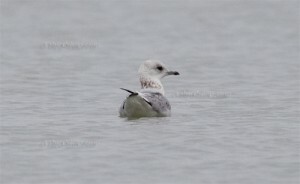 heinei is a late arrival at the western Black Sea this individual probably belongs to the nominate race of Larus canus. To cope with the growing demand for top shots of the rarer species of the Palearctic Bird-Lens is keen to enrich the range of pictures of birds you can find in the western palearctic. Trips to remote places to capture images of rare birds of western palearctic were very successful. This image of a remarkable sighting is only a first impression, what you will find in the gallery or in the “Pictures Shop” very soon. Just give me a message, if I could serve you with an image needed before the new pictures are online.